Live “Skype” Q&A with Director Bill Bennett following screening. PGS – Intuition is your Personal Guidance System is a film shot all around the world over a three-year period. It documents Bill Bennett’s journey to find the source of a voice which saved his life. Coach2Edify is a 501(c)(3) nonprofit dedicated to creating health and wellness programs for underserved populations. Our Time Shift film screenings unite a network of film professionals with those seeking to create social change. 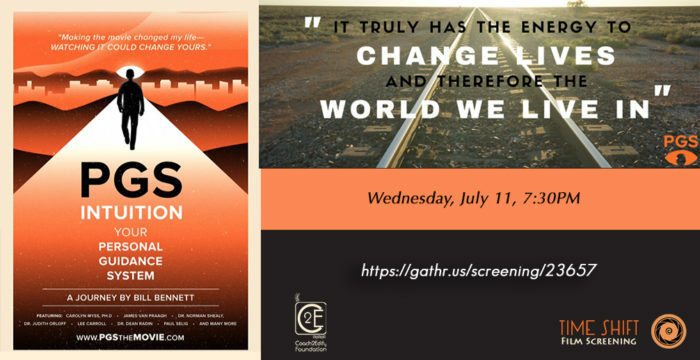 Your ticket of $17.50 buys the screening event, your generous additional donation will go directly to support C2E’s Foundations of Well-Being FREE lectures to organizations assisting underserved populations. The movie features some of the world’s leading experts on intuition, spanning the fields of science, religion, and spirituality, and discusses what is intuition, how it works, and how we can access it to lead a more enriching life. Making the film changed Director Bill Bennett’s life – watching it could change yours.